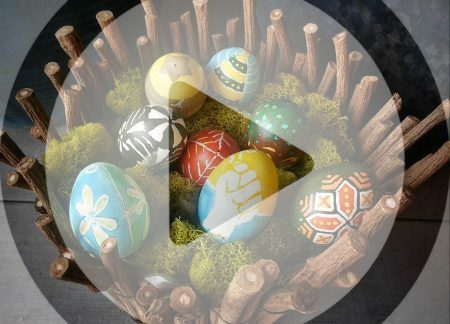 Here is a video tutorial for a basketful of Ukrainian Easter eggs–also known as pysanky. 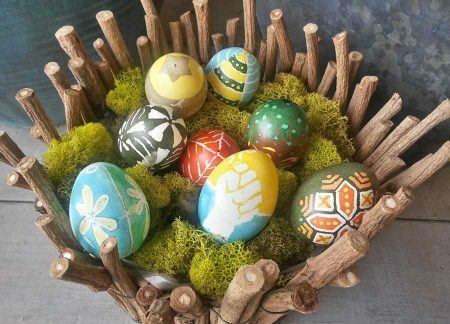 The Ukrainian method of Easter egg dyeing resembles batik where you use wax to block areas from the dye. You work in layers, blocking out the lightest colors first, then adding layer after layer of dye and wax resist. Once the layers are done, you then melt the wax to reveal the complete design. This last step is very satisfying, making this a great activity for the whole family to work on together. That is exactly what you will see in the video below: Spring break with a bunch of cousins sitting around the kitchen island dyeing Easter eggs together. I hope you try and enjoy this ancient craft idea.